Please note the change in time and place for this week’s instalment of the “Frontiers in Robotics Research” seminar series. Robots have transformed many industries, most notably manufacturing, and have the power to deliver tremendous benefits to society, for example in search and rescue, disaster response, health care, and transportation. They are also invaluable tools for scientific exploration of distant planets or deep oceans. A major obstacle to their widespread adoption in more complex environments and outside of factories is their fragility. 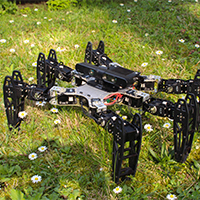 While animals can quickly adapt to injuries, current robots cannot “think outside the box” to find a compensatory behavior when they are damaged: they are limited to their pre-specified self-sensing abilities, which can diagnose only anticipated failure modes and strongly increase the overall complexity of the robot. In this talk, I will present a different approach that considers having robots learn appropriate behaviors in response to damage. However, current learning techniques are slow even with small, constrained search spaces. To allow fast and creative adaptation, we combine the creativity of evolutionary algorithms with the learning speed of policy search algorithms. The resulting intelligent trial and error algorithm allows robots to adapt to damage in less than 2 minutes, thanks to intuitions that they develop before their mission and experiments that they conduct to validate or invalidate them after damage. The result is a creative process that adapts to a variety of injuries, including damaged, broken, and missing legs. Antoine Cully is Lecturer at Imperial College London (United Kingdom). His research is at the intersection between artificial intelligence and robotics. He applies machine learning approaches, like deep learning and evolutionary algorithms, on robots to increase their versatility and their adaptation capabilities. He received the M.Sc. and the Ph.D. degrees in robotics and artificial intelligence from the Sorbonne University of Paris (previously called UPMC), France, in 2012 and 2015, respectively, and the engineer degree from the School of Engineering Polytech’Sorbonne, in 2012. His Ph.D. dissertation has received three Best-Thesis awards. He has published several journal papers in prestigious journals including Nature, IEEE Transaction in Evolutionary Computation, and the International Journal of Robotics Research. His work was featured on the cover of Nature (Cully et al., 2015) and received the “Outstanding Paper of 2015” award from the Society for Artificial Life (2016), and the French “La Recherche” award (2016).